Today is a bit of a slow day in terms of new information. I did get to speak with the VP of Sales at Buzz Bee this morning, discussing changes in business after joining Alex Brands. 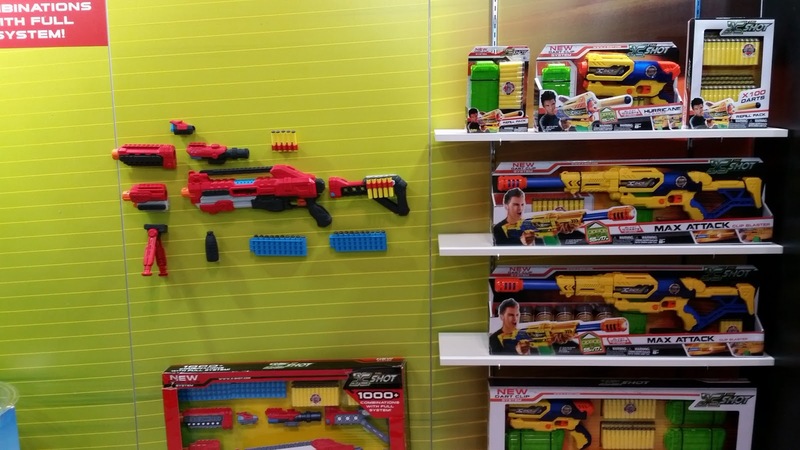 In addition, we spoke about a few changes in blaster focus. Sad to say, Air Max will be no more. 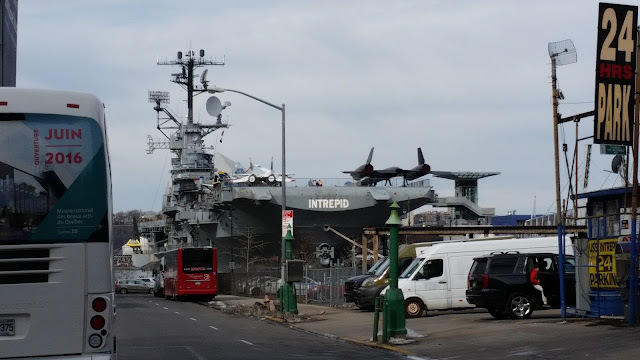 In the meantime, I get to spend a little time on me and feed my childhood fascination with giant flying machines. The Intrepid is a short walk from the Convention Center. Update you later! Here goes nothing! I will update this post throughout the day as I see things of interest, and will do a full article/summary over on Blasterhub at the end. Repeat cycle until the fair ends. We have a contender for the next Big Blast, I think. Only the prototype was here, but it should be available in the fall for $25. 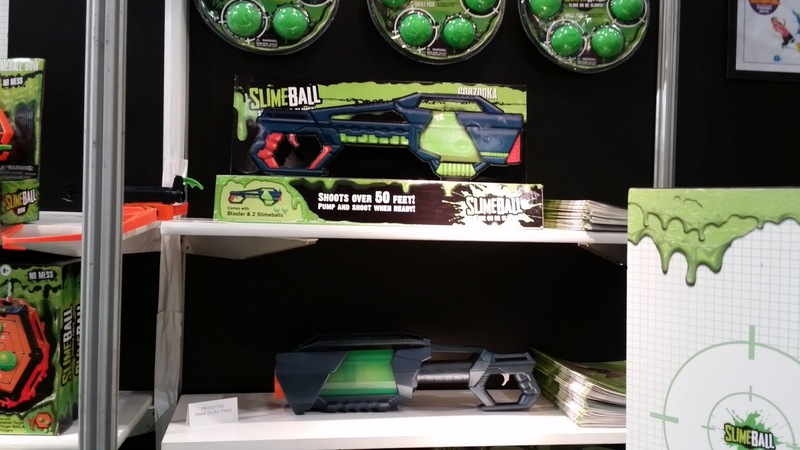 It's an air blaster that launches slime balls 50'. 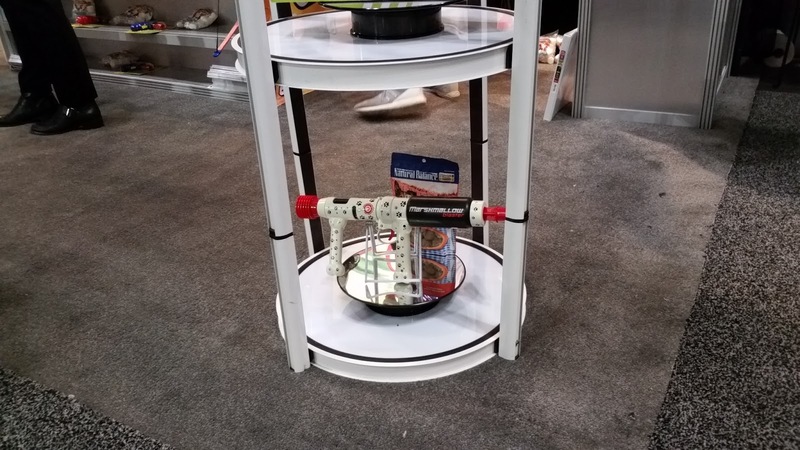 For the more technically minded, the trigger is mounted on the pump, with a rod in the middle of the pump handle tube that moves forward. Morever, the pump has to be in the forward position for the trigger to fire the tank. Based purely on this, I would speculate that it's a large piston valve tank, with the pump check valve pulling double duty as the dump valve for the system. 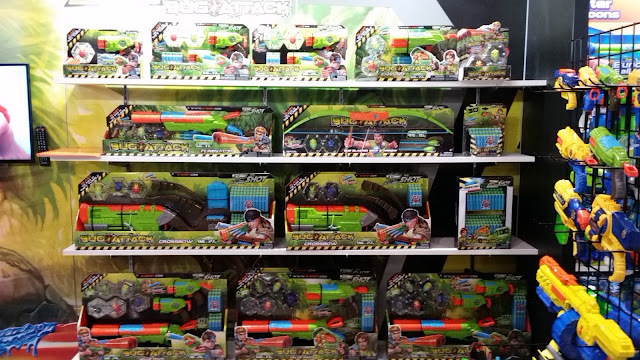 Next, we have the World Tech Toy blasters we've seen the past few months. No new developments, aside from a neat blue color scheme. Editing from my phone is proving interesting, to say the least. Anyway, we have the new items from Zuru, in several blaster lines. Along with already avaluable items, we have the new crossbow. After trying it out, it's very legit. Feels smoother and better than the Nerf Crossbow in my opinion. Next we have the Excel line. On the right, you see one of the revolvers in a coming color scheme. 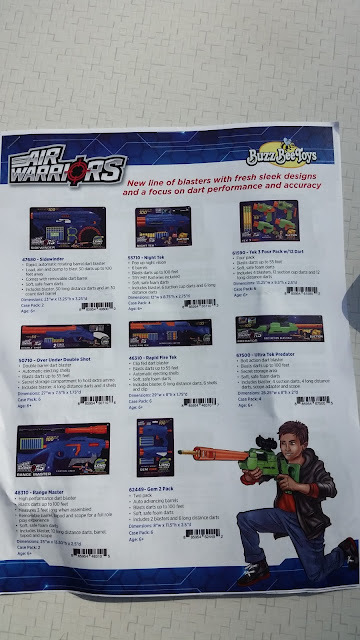 At the bottom, you can see their large new blaster. Or at least the box - the prototype broke, but you can still see it on the far right bottom of the previous picture. 40 darts, pump action, in two circles of 20 darts each. A selector on the side picks the set of 20 you want to fire. Fire 20 darts, flip the switch, and reload one circle while you're firing from the other. 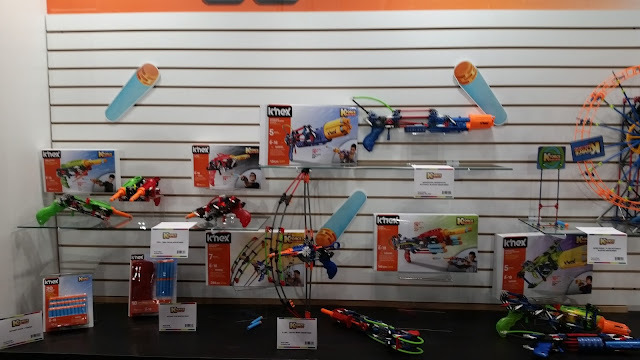 Perfect for HvZ. Lastly, we have the Zuru answer to Modulus, and at a $20 price point to boot. It takes actual dart clips, which may disappoint some users. It's called the Regulator. 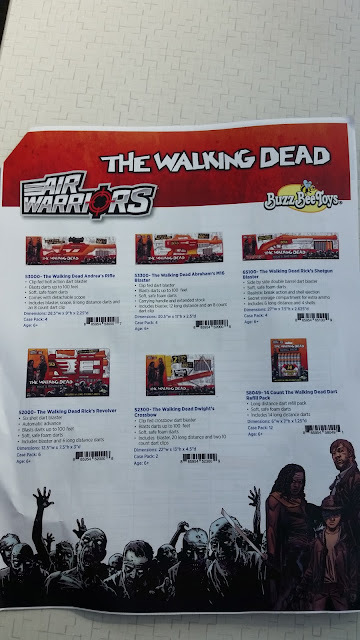 Lots of ground to cover here with the Buzz Bee releases. This is just what we have on display in the booth. 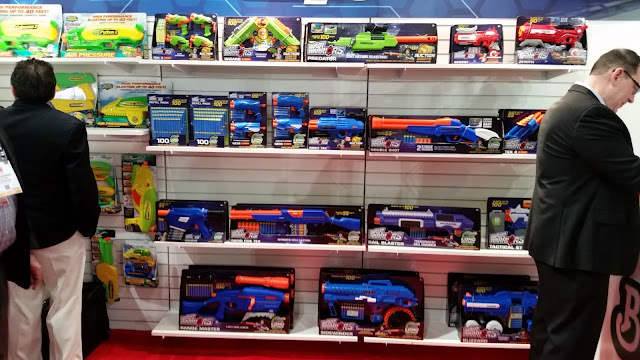 More blaster news will come at their event on Monday. In the meantime, high-res pics of the line. And then pictures of the shelves. Will be filling in words throughout the day. First, the darts. 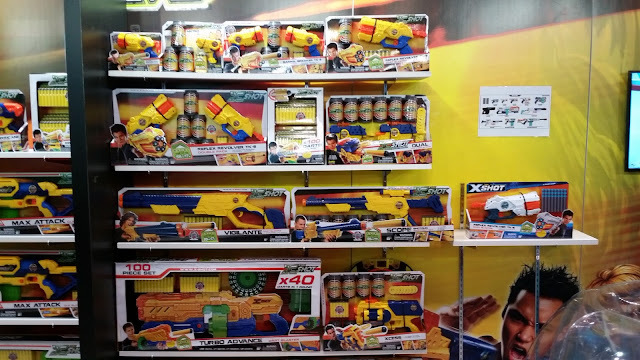 Buzz Bee, after doing their research into what people want in darts and what sells, is splitting their ammo into three streams. Normal suction, which they do really well; long distance, with a streamlined, rounded tip; and Precise pro darts, which give up a litthe range for accuracy. Internally, I don't know of any differences. That will have to wait until a later date so that I can tear product apart. The new blasters start on page 2, with the Blizzard being the Sidewinder/Colossal Blitz hybrid setup. Still a purely manual blaster, but has two rotating, removable drums. 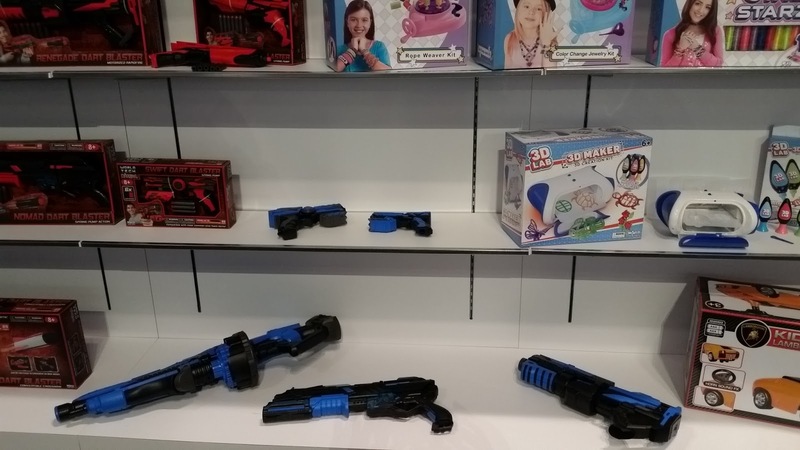 The Rail Blaster has a tubular magazine, similar to an actual firearm. We wI'll have to see how well the loading mechanism plays with other dart brands, damaged darts, etc. But it could be a great scavenger-type blaster. The Zenith is a Night Tek in function, but molded a bit differently. The Sentry appears to be like the Air Mac Baron in function, though I can't say it will be the same inside. Don't get your hopes up too much just yet. 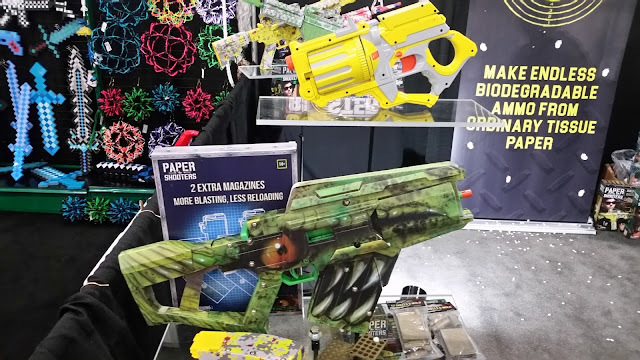 The Tactical Storm is their kinda modular blaster, which takes magazines. 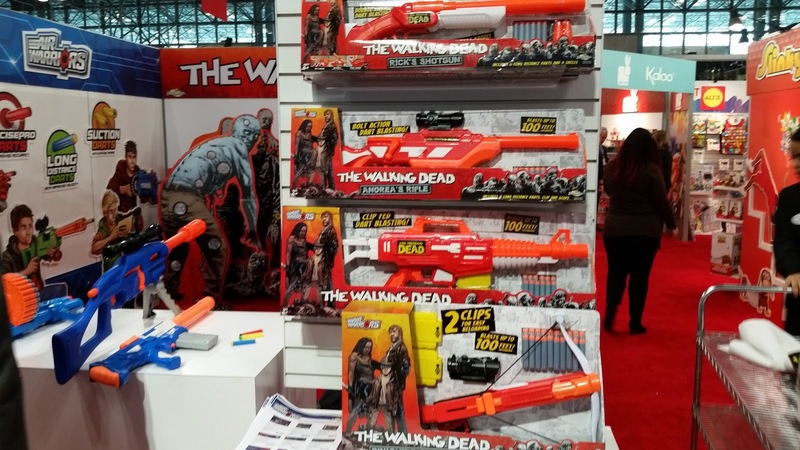 In the Walking Dead line, the big new thing is the magazine fed crossbow. I have yet to try it but will get on that. 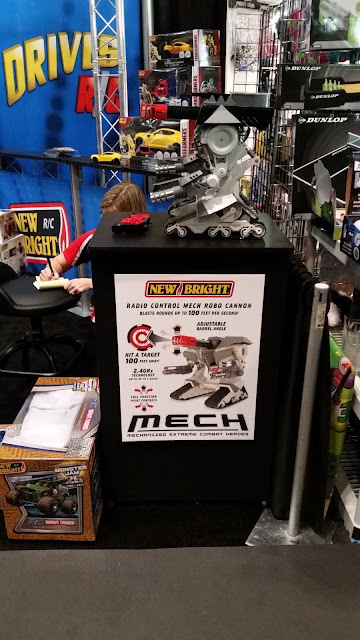 KNEX is still alive with the KFORCE brand! They're opting for no-nonsense construction toy packaging, and they have two new models coming out this year. Both are Rotoshot type blasters, with five rounds each. The Barracuda is pump action, although the setup for it is a bit awkward. I guess if your blaster is long enough, it can be made pump action. The other blaster is a lever acton revolver. You pull back the lever to prime, and then push it all the way forward to fire. No trigger here. Marshmallow Fun Company had been busy. They've made a new version of the Blaster that just uses one handle, and depending on the model fires fabric snowballs, giant balls, etc. The Marshmallow version features break-action loading. Some of the regular line on display. As a natural extension from firing balls and marshmallows, some models are now pet-oriented. One Extreme Blaster model is made for tennis balls. This old-model Blaster appears to be meant for firing treats...? 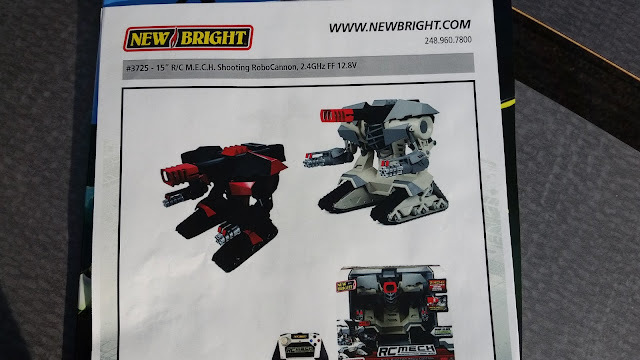 In the R/C section, this baby is meant to fire small Nerf-type balls. Seems I have bettrr information to pass on! The robot on display was a handmade prototype, with the real thing expected in July in the $160 to $170 range. 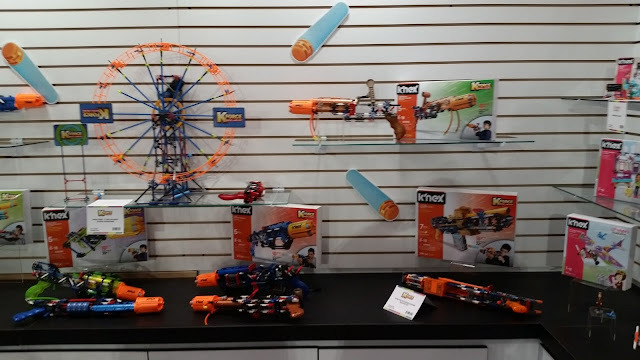 It has a revolving ammo chamber on top that holds twenty Nerf Rival type rounds (the ones used on display were the blue Cornucopia version, by the look of it). It operates off of a 4S LiFePO4 battery, judging by the voltage. It also has a laser sight and fires rounds in fairly rapid succession. I'll have a firing video up later, where I was the target. They enjoyed that. 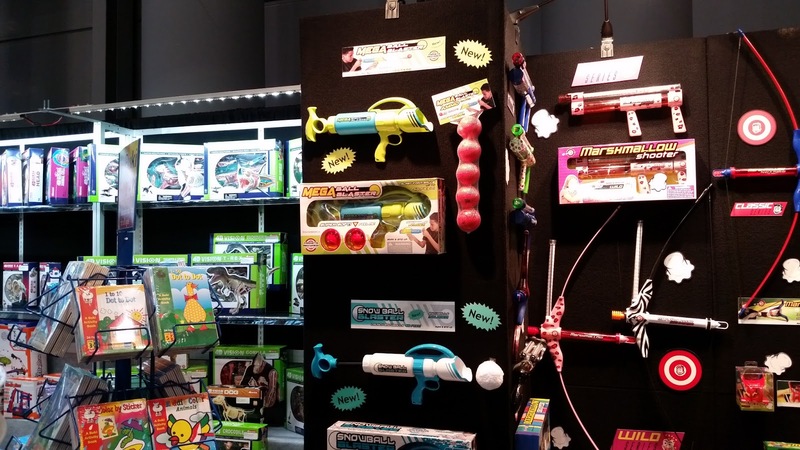 In Toysmith's display, we had fun things in their night sports section, including Capture the Flag units. 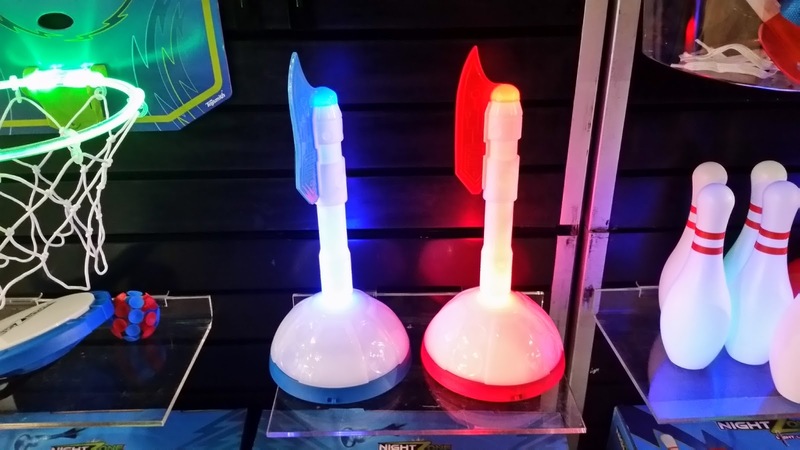 When the flags are in their bases, everything glows the correct color. When taken out, the base shuts off and the flags glow the opposite color. I got to take a look at Paper Shooters finally. I'm still not sure I would buy them, but the system works. 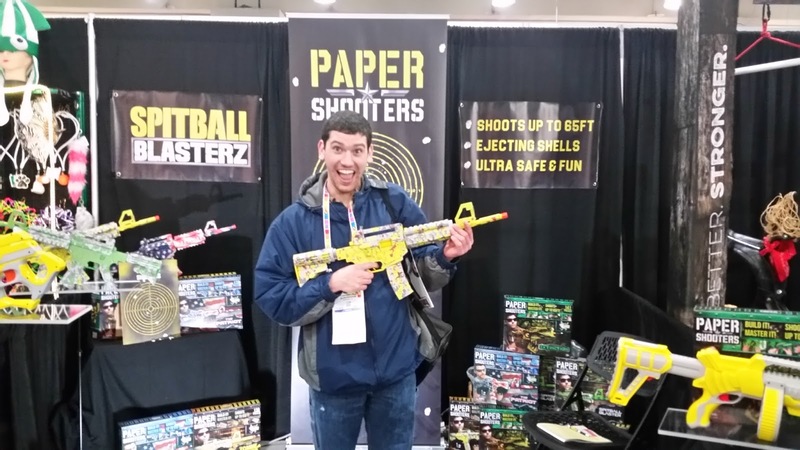 And shooting spit balls is fun! They have plastic molded kits coming, as well as more sci-fi looking products. 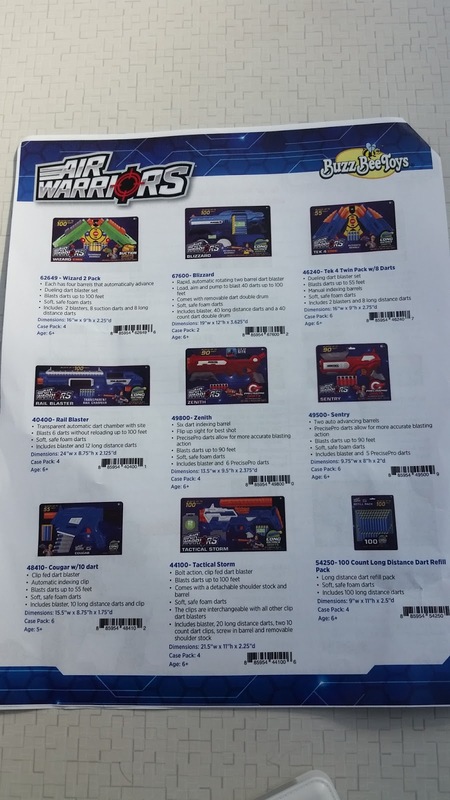 Because people for some reason wanted blasters that work out of the box and not to need to assemble anything. Obviously the guys at KNEX would disagree with that point of view, but they're startan with a DIY crowd to begin with. 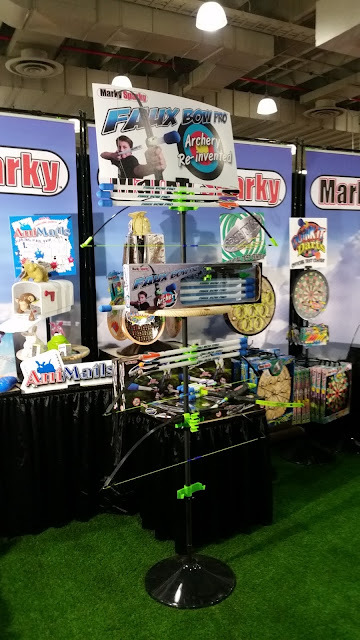 Marky Sparky, with their Faux Bow line expanding, looks to be adbancong well. 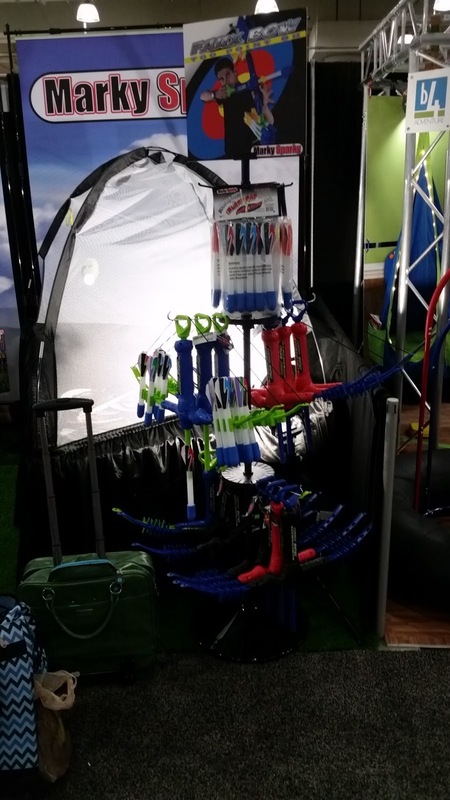 Faux Bow Pro, in addition to being a tongue twister, features tubular safety arrows that can be used with a real bow. Faux Bow Two Point Oh comes in more colors than the original black with red arms, and has storage space for 12 arrows. There is a 3.0 version that also supposedly shoots farther than ever. Just posting a quick update! 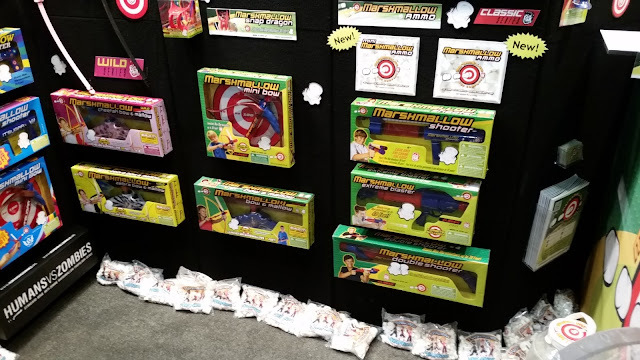 As of tomorrow, I'll be traveling to New York Toy Fair 2017 to see many of the new items coming to the world of foam flinging. I'm going to be reporting the goodies over on Blasterhub. 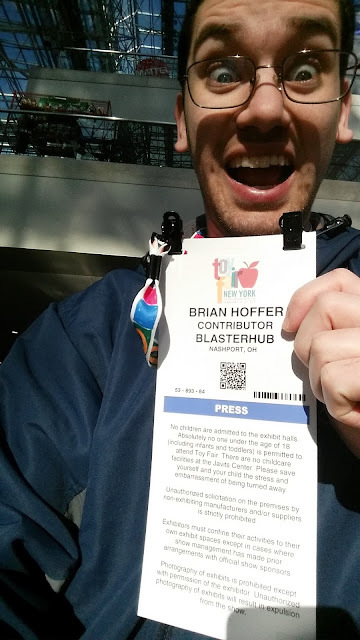 In between, however, I'll be posting near-live updates on here, as well as videos on my Youtube channel.